← All Press is Good Press! Remember building with blocks? The best part of all was knocking them down, right? There was nothing quite as satisfying as the crash and scatter of those colorful blocks. Well I just found an app that is almost as satisfying: BridgeBasher by Jundroo LLC, which combines construction, physics, scientific testing, and the pleasure of destruction (iPhone/iPad: $0.99/Android: Free). The app opens with an offer to provide instructions—always a good thing in my book, as I am not always intuitive about apps. Once you get past that, the app does have an ad for Simple Rockets, the newest app offered by the developer. BridgeBasher is good enough to warrant overlooking this ad, and a button later on that offers the new app. The next screen shows a picture of a span across a chasm with a grid of dots over it. Lazy clouds float past. Your job is to draw from dot to dot to create a bridge across the chasm. Sounds ridiculously simple, doesn’t it? Well, it is. But the fun is just beginning. After you’ve created your bridge, you naturally have to test it. After all, the game explains, you can’t really know how much your bridge will hold until it reaches the breaking point, right? 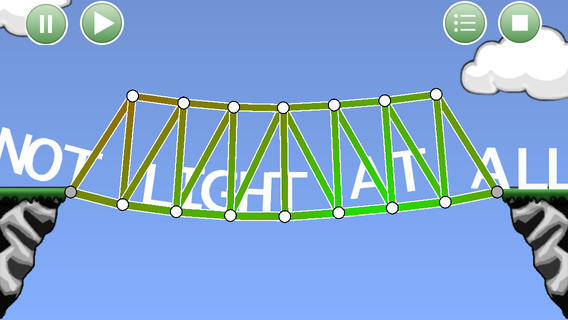 Press the arrow key in the top right corner to test the bridge’s strength. You have three testing options: balls, words, and joint weights. 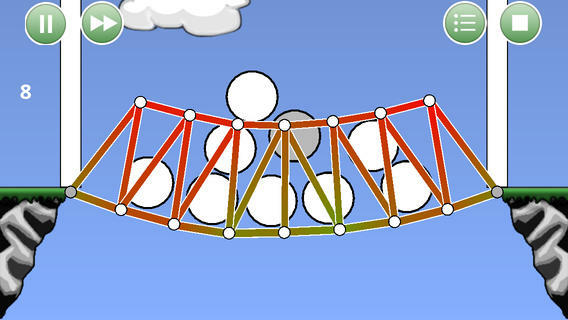 If you choose balls, you’ll be adding weighty balls to the bridge with touches until the bridge crashes. Next, try the words (there is another ad button here for Simple Rockets). These words rattle across the bridge like a train, describing the weight that they are imitating (Light, Not So Light, Kinda Heavy, etc). The bridge will flex and bounce, and changes in color will demonstrate the stresses on the bridge and show you the weaknesses until the whole thing dramatically gives way. Next, use a touch to add weights to the joints of the bridge. This will also lead to eventual collapse. Once you’re done with each test, the app gives you a score and a (sometimes snarky) comment about the strength of your bridge. Build your bridge strong enough and the app will tell you to quit wasting time and go do something productive! This was so unexpected that it made me laugh out loud. After each test, you have the ability to go back in and edit your bridge, strengthening or changing it. The hammer in the top left allows you to remove part of the bridge, or the entire thing. The top left arrow is an undo button, and the list button in the top right corner is your Help, Save, and Load button. BridgeBasher also gives you the option of sharing your bridges with friends so they can destroy them, too. 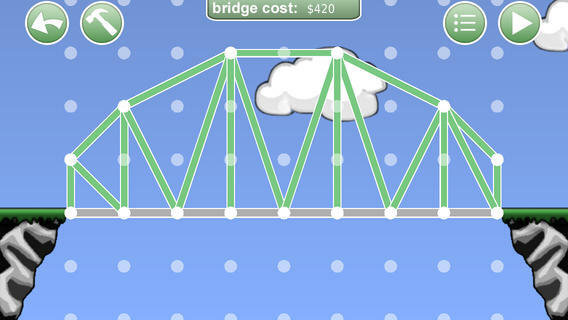 A small button at the top middle gives you the cost of the bridge as you’re building it. I think this app would be the perfect addition to any elementary- to high school-age program that is exploring the physics of construction. It was certainly addictive enough to keep me playing! Posted on September 15, 2014, in Apps and tagged Awnali Mills. Bookmark the permalink. 1 Comment.